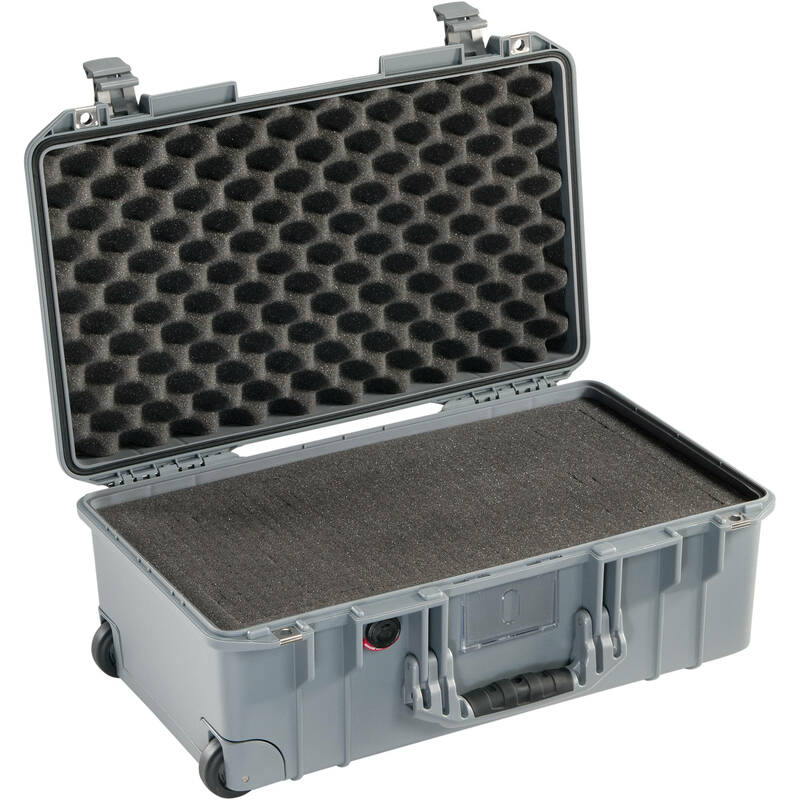 Combining strength and lightness, the silver Pelican 1535 Air Wheeled Carry-On Case with Pick-N-Pluck Foam 2017 is watertight, crushproof, dustproof, and optimized for travel. For travel by air, Pelican has aggregated available airline rules for maximum overhead and check-in dimensions with the goal of creating a case that conforms to their requirements. Of course, there will always be exceptions, so it's wise to contact your carrier before departing. Your 1535 Air case is made of a super-light, proprietary HPX polymer with honeycomb structural elements that is up to 40% lighter than most other Pelican polymers. This confidence-inspiring design has been drop-tested on concrete on all sides and corners while loaded with gear. Not content to stop there; the case is also tested with a 28 lb steel dart dropped from a height of 3 feet, submerged for 30 minutes at a depth of 3.3 feet, and wheels are roll tested over 1,000 yards with loads at 5 mph. Fully-featured, the case has ABS double-throw latches that accept a user-supplied padlock, a watertight O-ring gasket, an automatic purge valve, and stainless-steel hasp protectors. Users will appreciate the new, stylish conic curve lid shape, rubber overmolded handles, and an extending trolley handle. Additionally, for easier case ID, there's an attractive, removable polycarbonate card holder that may be placed on the front or side of the case. Organizing equipment is an easy and straightforward operation with the Pick-N-Pluck foam interior. Simply arrange the gear you wish to carry on the foam, try a variety of placements, and when you're satisfied, remove pieces of foam until items fit to your satisfaction. Box Dimensions (LxWxH) 22.25 x 14.5 x 9.25"
1535 Air 2017 Wheeled Carry-On Case with Pick-N-Pluck Foam (Silver) is rated 4.0 out of 5 by 2. Rated 4 out of 5 by Ryan from Great Case - Would Recommend I purchased the Pelican 1485 as a standby to test for transporting photography equipment or firearms. I ended up using the 1485 for a couple of months before realizing I should just up to the 1535 for travel. I was hoping the foam would allow a deeper placement of the Nikon D810 with a grip, but again I have to separate them for fitment. Note that on the top and bottom edges, if you pluck the foam, you will have the inside of the case exposed that could make contact with your equipment. I used the plucked foam and made smaller folded sections that I shoved down there and put items that I'm worry about less on those extremes. I'll most likely buy the trekpack inserts. Currently the case is holding - 2 D810 batteries, Nikon D810, grip, 4 lenses, two sb910s, two pocketwizard III+'s, cables, and has space for most likely another lens or a cutout for extras. On the flat open section that's left I currently have a harddrive and a mini pelican with SD cards. Rated 4 out of 5 by Shinichi from Some improvements needed It works great and I love it! But there is one complaint about this product. The bottom does not have any rubber feet, so when you drag it on a concrete and put it on a ground, the bottom gets scraped/ or scratched. I did not like it, so thinking about putting some rubber feet! Are you able to purchase the 1535 with the LFC package? or mobility kit? The 1535 can come with a TrekPak but no LFC package. Pelican 1535AirTP Wheeled Carry-On Case (Black, with TrekPak Insert 2017) B&amp;H # PE1535ATPBK. I know the 1535air is mainly a carry on bag but is it still durable if it is checked luggage? I'd like to know if it is still durable considering it is a lot lighter than the 1510. Thebpelican air is really great I would have no problem checking it. I wouldnt check curtain items such as lenses and expensive cameras if I can help it regardless of the case.